Going abroad ? Plan on using your computer, cell phone, hair dryer? The PVTC series step up/down voltage transformers offer you a safe, dependable, cost-effective and easy solution to converting voltages from 110-120 volts up to 220-240 volts or from 220-240 volts down to 110-120 volts for both home use and commercial applications. 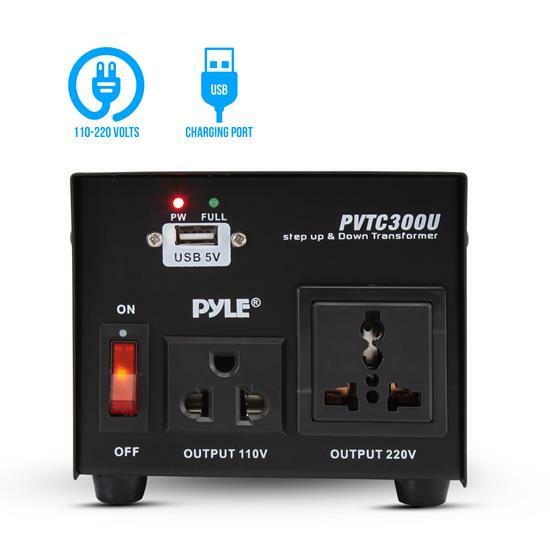 The PVTC300U comes with a power rating of 300w, a heavy-duty power cord, a standard US 3-prong plug, and an American to European outlet adaptor. There are a total of three types of outputs on the front panel. Two are grounded outputs, one designated for 120 volts with a US standard outlet. The other output is for 220 volts only with a universal outlet. The last one is a 5V standard USB jack. And most importantly, all three outputs can be used simultaneously & continuously.